cell types that reside in the sinusoidal compartment [1-3]. relationship to pathological rather than normal conditions. tochemical stains, as described below. lum , the latter for revealing the liver architecture. structure was rather scarce (Figures 1(a) and (b)). (Figures 3 (a) and (b)). sence of Ito and Kupffer cells (see Table 2). them; PK = Proteinase K). parenchyma is normal. A portal area is present (arrow). (arrow). Scale bar 200 µm. ticular fibers running. Scale bar 200 µm. Figure 4. Ruminant liver. GFAP-immunohistochemistry. tions. Scale bar 100 µm. Figure 5. Ruminant livers. Desmin-immunohistochemistry. (asterisk). Scale bar 100 µm. Figure 7. Ruminant livers. Desmin immunohistochemistry. isk). Scale bar 200 µm. of all the animals studied. the CD 68 anti-body (data not shown). 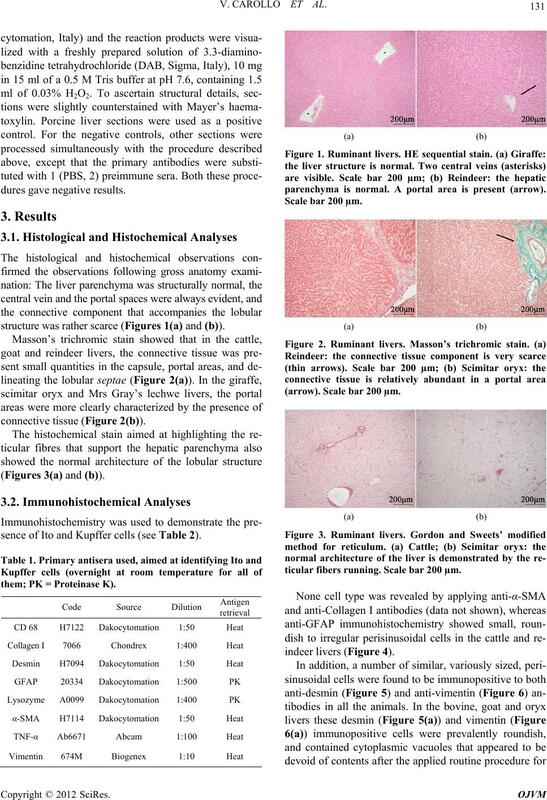 which is in line with Uetsuka’s study on bovine liver . matory, toxic, infectious or metabolic stimuli [25,26]. 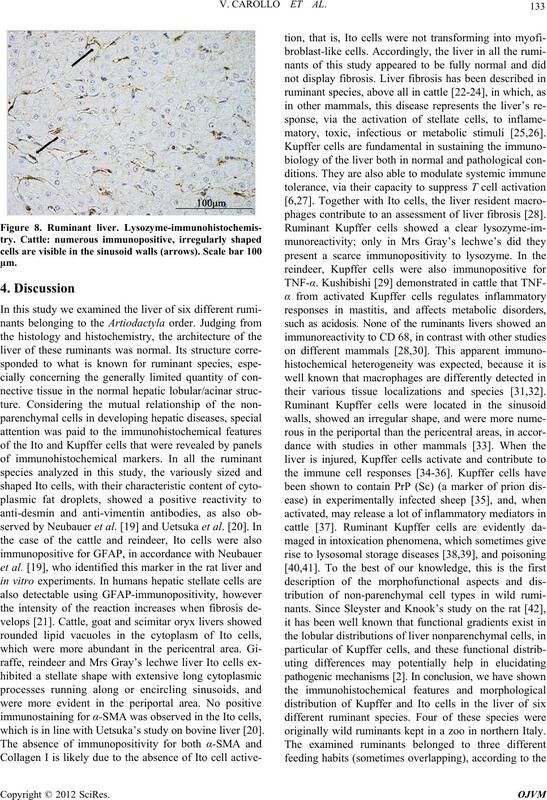 phages contribute to an assessment of liver fibrosis . 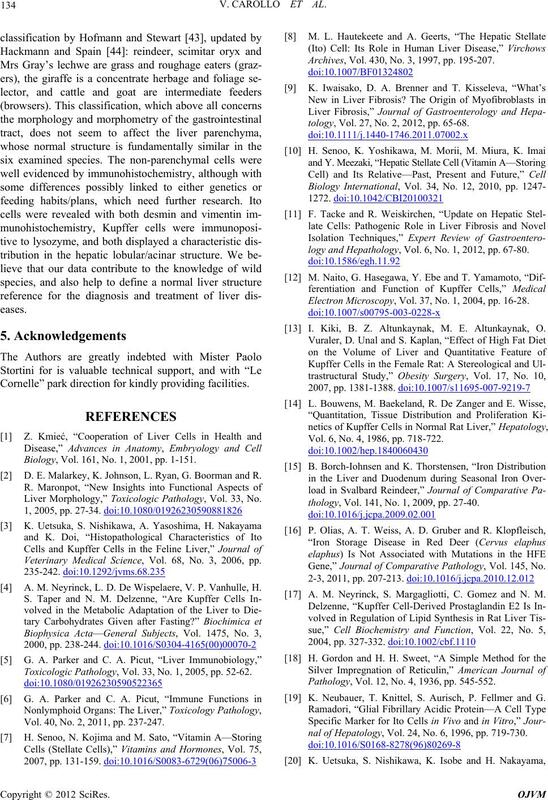 their various tissue localizations and species [31,32]. originally wild ruminants kept in a zoo in northern Italy. Cornelle” park direction for kindly providing facilities. Biology, Vol. 161, No. 1, 2001, pp. 1-151. D. E. Malarkey, K. Johnson, L. Ryan, G. Boorman and R.
Liver Morphology,” Toxicologic Pathology, Vol. 33, No. Veterinary Medical Science, Vol. 68, No. 3, 2006, pp. A. M. Neyrinck, L. D. De Wispelaere, V. P. Vanhulle, H.
Toxicologic Pathology, Vol. 33, No. 1, 2005, pp. 52-62. Vol. 40, No. 2, 2011, pp. 237-247. Archives, Vol. 430, No. 3, 1997, pp. 195-207.
tology, Vol. 27, No. 2, 2012, pp. 65-68.
logy and Hepathology, Vol. 6, No. 1, 2012, pp. 67-80. Electron Microscopy, Vol. 37, No. 1, 2004, pp. 16-28. I. Kiki, B. Z. Altunkaynak, M. E. Altunkaynak, O.
Vol. 6, No. 4, 1986, pp. 718-722.
thology, Vol. 141, No. 1, 2009, pp. 27-40. 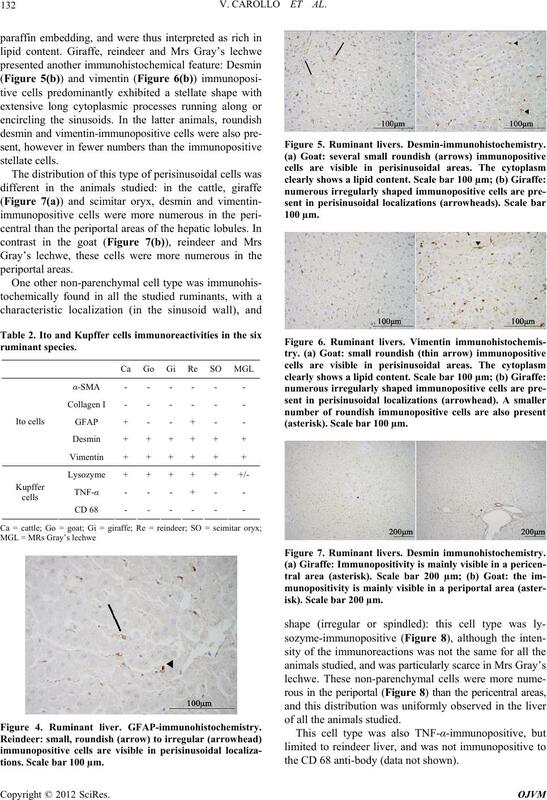 Gene,” Journal of Comparative Pathology, Vol. 145, No. A. M. Neyrinck, S. Margagliotti, C. Gomez and N. M.
Pathology, Vol. 12, No. 4, 1936, pp. 545-552. K. Neubauer, T. Knittel, S. Aurisch, P. Fellmer and G.
nal of Hepatology, Vol. 24, No. 6, 1996, pp. 719-730. Veterinary Medical Science, Vol. 69, No. 7, 2007, pp. S. Morini, S. Carotti, G. Carpino, A. Franchitto, S. G.
No. 4, 2005, pp. 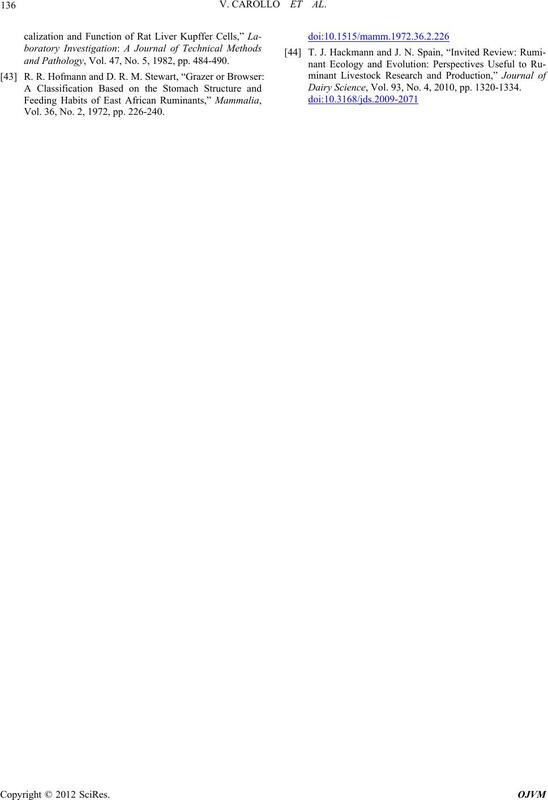 193-207.
terinary and Human Toxicology, Vol. 45, No. 3, 2003, pp. 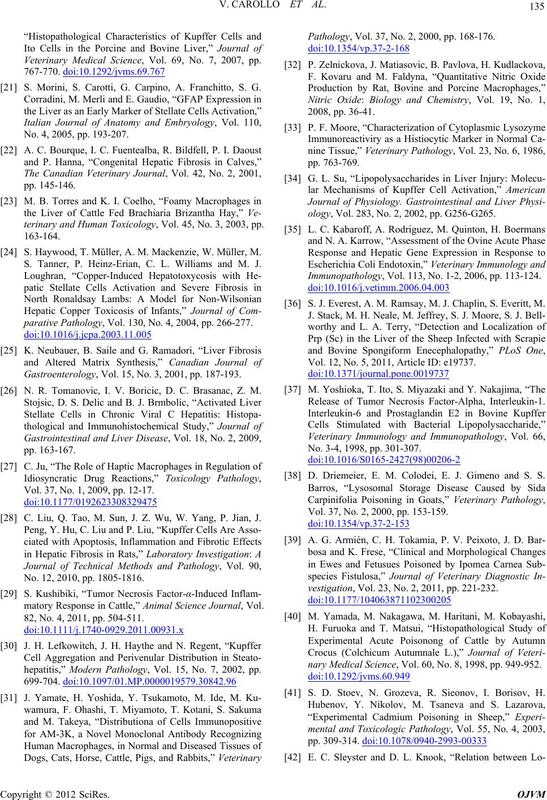 S. Haywood, T. Müller, A. M. Mackenzie, W. Müller, M.
S. Tanner, P. Heinz-Erian, C. L. Williams and M. J.
parative Pathology, Vol. 130, No. 4, 2004, pp. 266-277. Gastroenterology, Vol. 15, No. 3, 2001, pp. 187-193. N. R. Tomanovic, I. V. Boricic, D. C. Brasanac, Z. M.
Vol. 37, No. 1, 2009, pp. 12-17. C. Liu, Q. Tao, M. Sun, J. Z. Wu, W. Yang, P. Jian, J. No. 12, 2010, pp. 1805-1816.
matory Response in Cattle,” Animal Science Journal, Vol. 82, No. 4, 2011, pp. 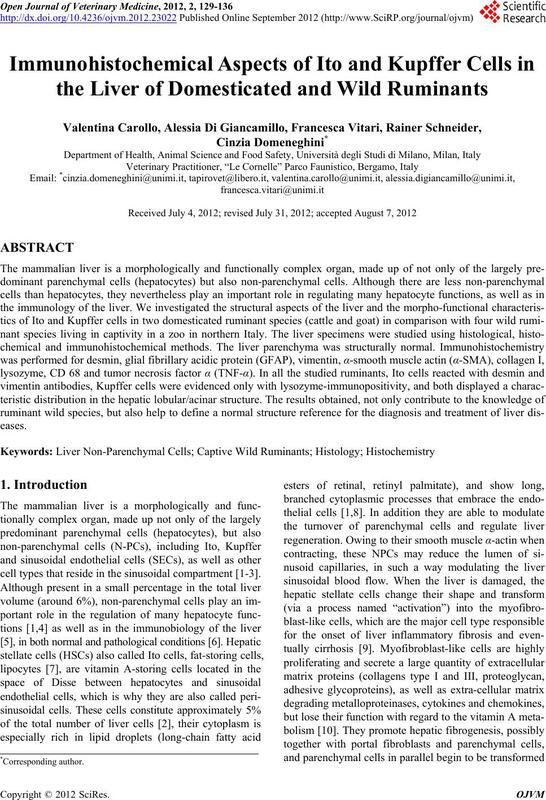 504-511.
hepatitis,” Modern Pathology, Vol. 15, No. 7, 2002, pp. Pathology, Vol. 37, No. 2, 2000, pp. 168-176.
ology, Vol. 283, No. 2, 2002, pp. G256-G265. 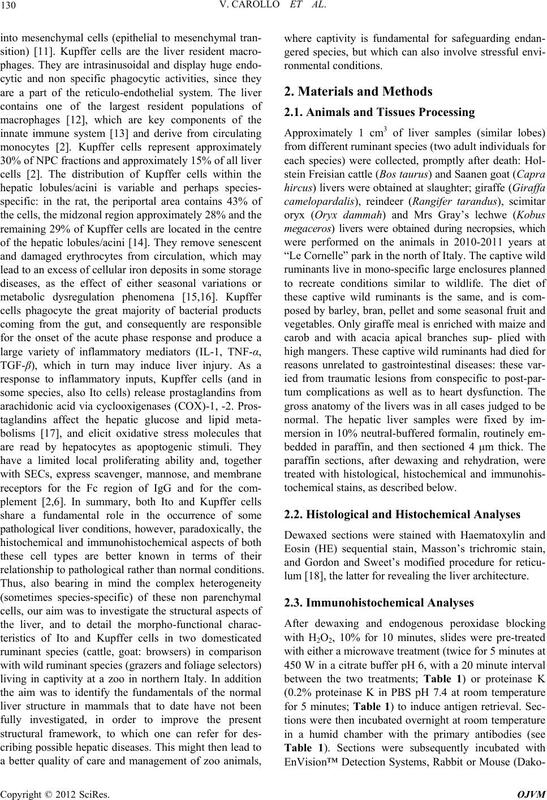 Immunopathology, Vol. 113, No. 1-2, 2006, pp. 113-124. S. J. Everest, A. M. Ramsay, M. J. Chaplin, S. Everitt, M.
Vol. 12, No. 5, 2011, Article ID: e19737. Release of Tumor Necrosis Factor-Alpha, Interleukin-1. No. 3-4, 1998, pp. 301-307. D. Driemeier, E. M. Colodei, E. J. Gimeno and S. S.
Vol. 37, No. 2, 2000, pp. 153-159.
vestigation, Vol. 23, No. 2, 2011, pp. 221-232.
nary Medical Science, Vol. 60, No. 8, 1998, pp. 949-952. S. D. Stoev, N. Grozeva, R. Sieonov, I. Borisov, H.
and Pathology, Vol. 47, No. 5, 1982, pp. 484-490. Vol. 36, No. 2, 1972, pp. 226-240. Dairy Science, Vol. 93, No. 4, 2010, pp. 1320-1334.